Mia: I’m sure they got there using this ring. Hmm. How’d they get it off? Mia: Gah! I have got to change my ringtone. Mia: Hey Connie! What’s up? Connie: Molly just called and told me that Chris broke up with Brianna! Mia: Wow! Word travels fast in this town. I already knew. Connie: How did you know? Did Molly call you too? Mia: No. Chris told me. A lot of the new electronic music sounds like it came from the 80s. Though, I’m a big fan of M83 and Imagine Dragons. I see laptop. I’d be straight onto Google researching that book and the things in it. Now, see… Google can ruin the magic. She’d better Google on a computer at the library. Otherwise, the Men in Black might show up and try to remove her ring, or worse, try to recruit her. Although, I think she could pull off the whole black suit and sunglasses thing. 🙂 Can’t you see Mia and Will Smith landing hard on the deck of the True North? Will Smith lands flat on his face, then jumps up, dusts himself off, and says, “I meant to do that.” Then he neuralizes anyone who saw him sprawled out on the deck. I’d love to see that as a non-canon filler strip. I’m just afraid that Mia would use her neuralizer to make Brianna forget Chris, and all of high school. Also… there are several torn pages. A lot of what’s in the book are simply illustrations. HMMM. I love that song… No I don’t care if that makes me a total nerd. Thank you so much! Glad you like it and glad you can comment now. I love her expression as she looks at her phone! Also, I think the comment ate the last comment I tried to leave, so let me say it again: I am addicted to this comic. And slightly in love with Rhen…. I quit hating that song when my boyfriend used it to ask for my number. Thank you. I am glad you like the comic and Rhen. He is something. Can you post a chapter a day? Because it’s not interesting, every day only one page! But i love your story. I wish we could do that. Unfortunately, we can’t. We post as we get them done. Then we put them in a book later. Do you know that your readers are all over the world? Hello Sophia. It is a pleasure to meet you. I am glad we have readers from around the world. I do wonder where all are readers are from. Thank you for joining us from Israel. Yes, I think it would be neat to know where readers are from. Hello to you in Finland…very cool! Awesome! Glad you are reading from Canada! So far we have posters from the Ukraine, from Finland, and now from Canada. Love it! Thank you. I love the expressions Thom usually comes up with too. I just went back to the beginning and noticed how different your style has become. Before the faces used to be rounder and more child-like, but now, everything is more crisp and straight. it’s matured a lot since you began. congratulation i say. Thank you! Yeah, the style has evolved since the beginning. 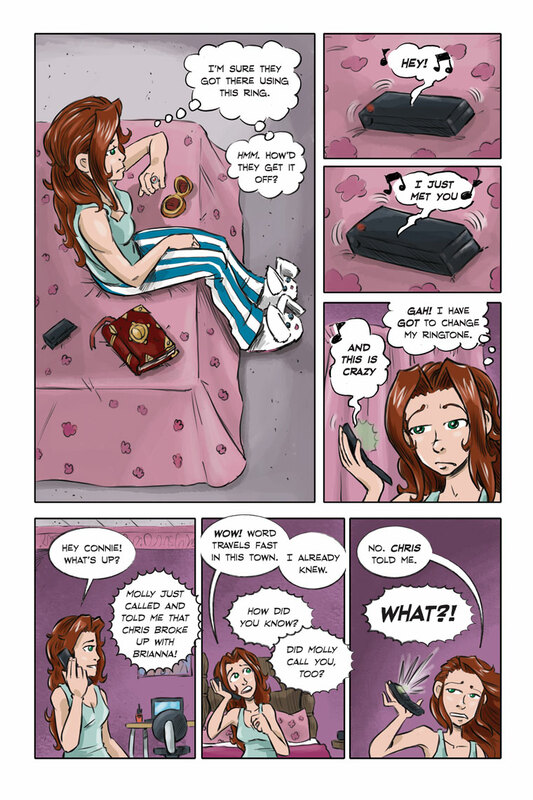 Originally, I drew the comic by hand in pencil and colored it on a Wacom tablet. Now everything is drawn on a Yinova tablet (like a Cintiq). Some creators go back and redraw older pages to look more like their most current work, but I don’t see myself doing that. To me it’s like airbrushing a high school yearbook to take out the pimples and braces. I got a wacom a while back, but I found it so awkward that I boxed it away and never brought it out again. It was tiny… and it really needed a display ON the tablet itself. Trying to draw in smallscale and view the progress on the monitor at the same time was pretty much impossible. Technology has moved on again since then though. Maybe now there would actually be hope. Drawing on a large touch-screen device, direct to the screen, would be ideal….. assuming it could run an old program like Paint Shop Pro. We are in the path of Sandy. If we lose power pages could be delayed this week. Just FYI. I asked Thom to post but he never did.